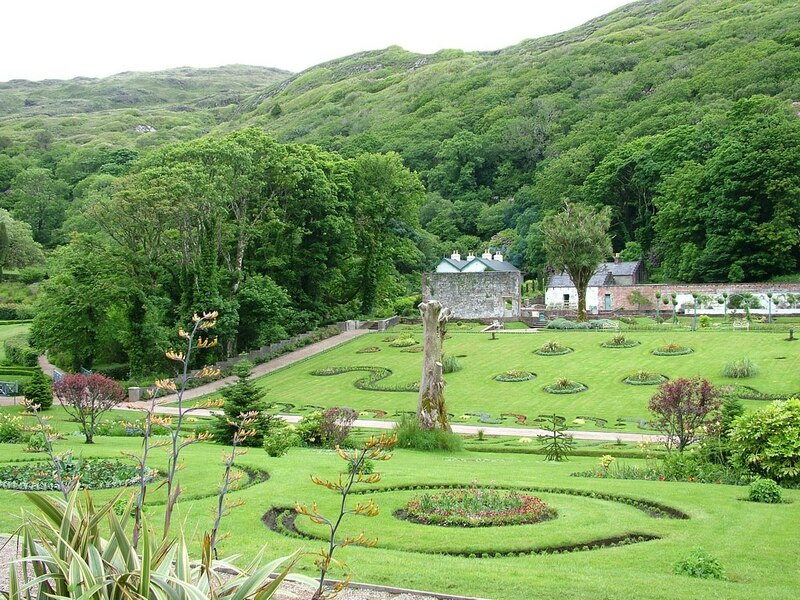 The grandeur of Kylemore Abbey extends well beyond the opulence of the original Castle to the expansive Victorian Walled Garden that rises from the heretofore boggy moorland in County Galway, Ireland. It is a magnificent example of what can be achieved when creative engineering is combined with tenacity and inspiration. 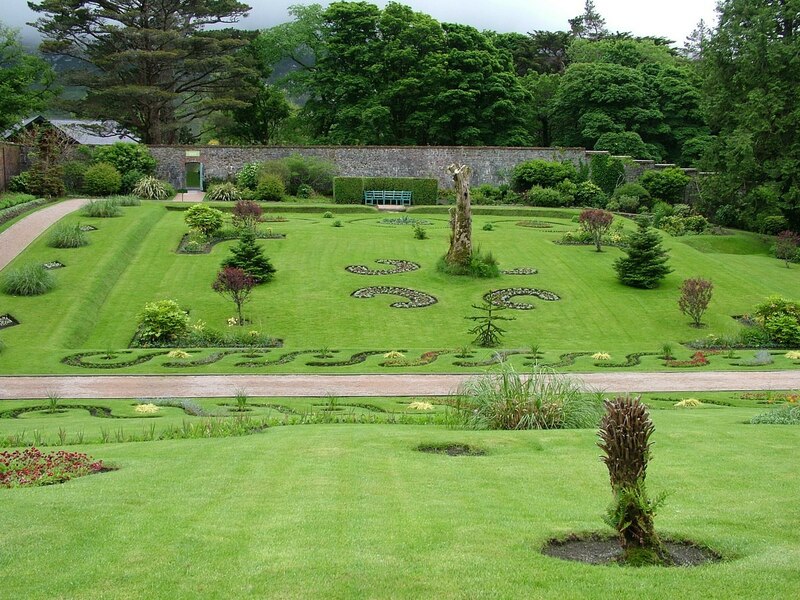 Our visit began with a tour of the public spaces in Kylemore Castle and followed up with a stroll to the “church in miniature” along the Lake Walk. 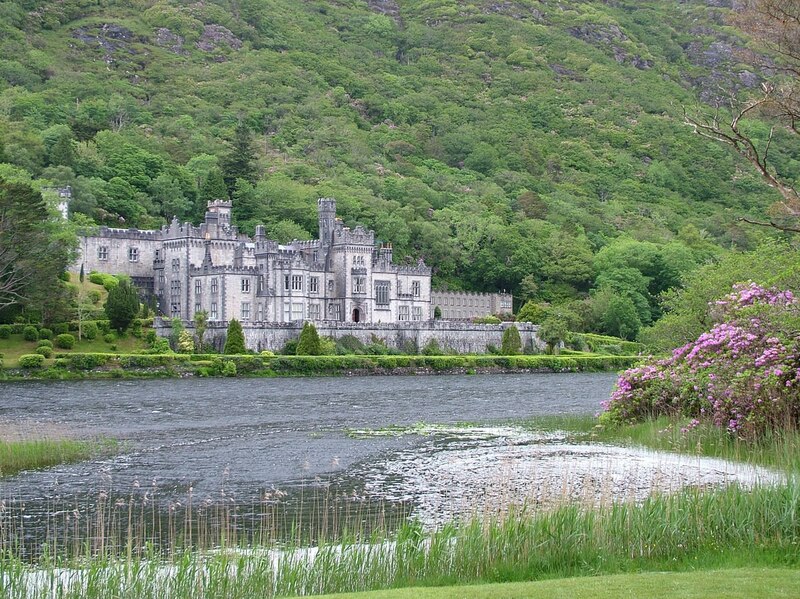 Kylemore Castle was built by Mitchell and Margaret Henry starting in 1867 when Mitchell purchased the property and created this fairytale castle as a gift for his beloved wife. 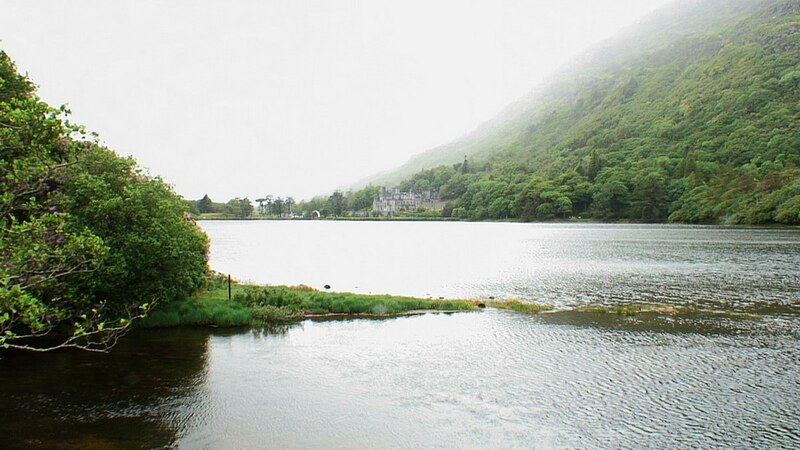 The Henry’s used to visit Connemara during fishing season as it was a popular destination for hunters and fishermen, and they routinely rented Kylemore Lodge, which predated Kylemore Castle on the site before Henry bought the land. Kylemore Estate, like all of Connemara, has landscape dotted with mountains, lakes and bogs, and as part of Mitchell’s ongoing efforts to improve and advance the lifestyle of locals and bring material and social benefits to the whole region on the heels of the Irish Potato Famine, he began reclaiming thousands of acres of moorland by draining bogs and planting thousands of trees. 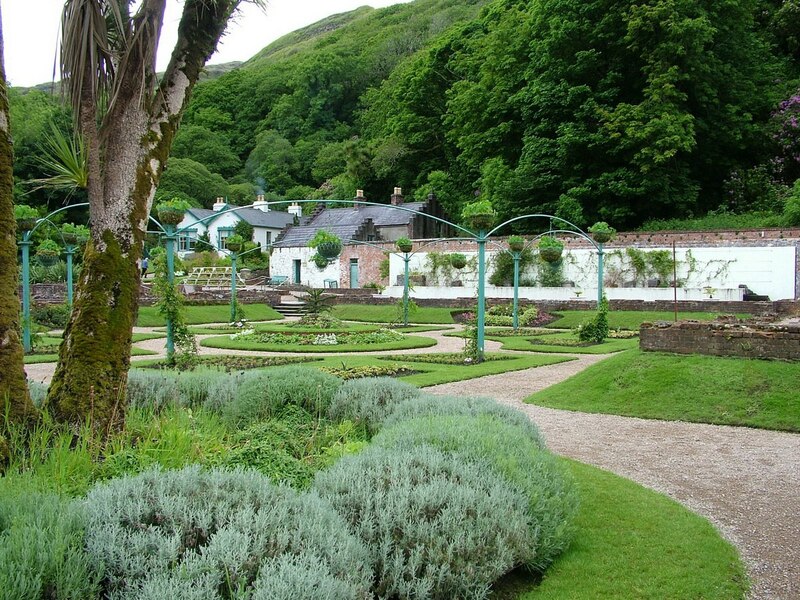 On part of the estate, Mitchell was successful in transforming the wasteland into an award-winning 6-acre Victorian Walled Garden, and in the process, introduced many improvements to the locals’ lives by providing them with work, shelter and eventually a school for the workers’ children. 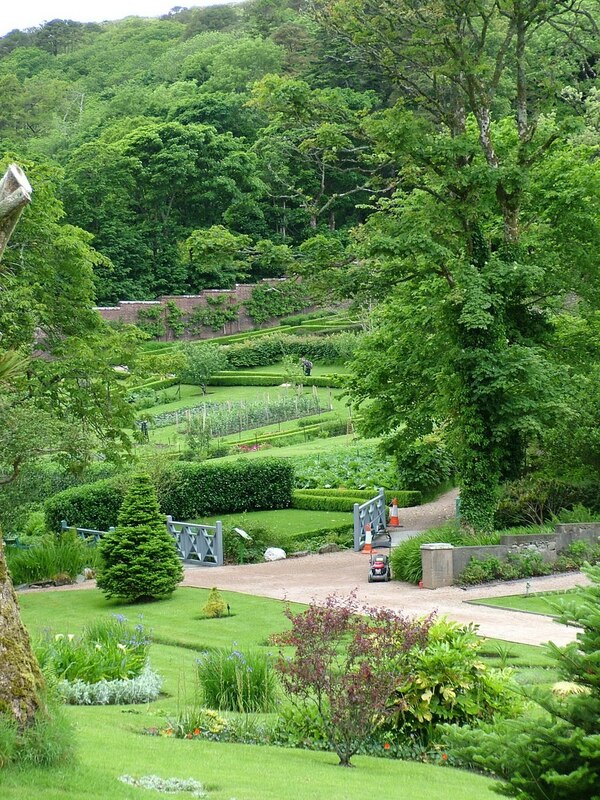 In typical Victorian tradition, the walled garden was far out of sight of the house. Bob and I were conducted from the Abbey to the entrance by a 10-minute shuttle bus ride along a mile-long (1.6 km) treed lane. The humble gates betrayed nothing of the secret universe hidden behind the high walls. 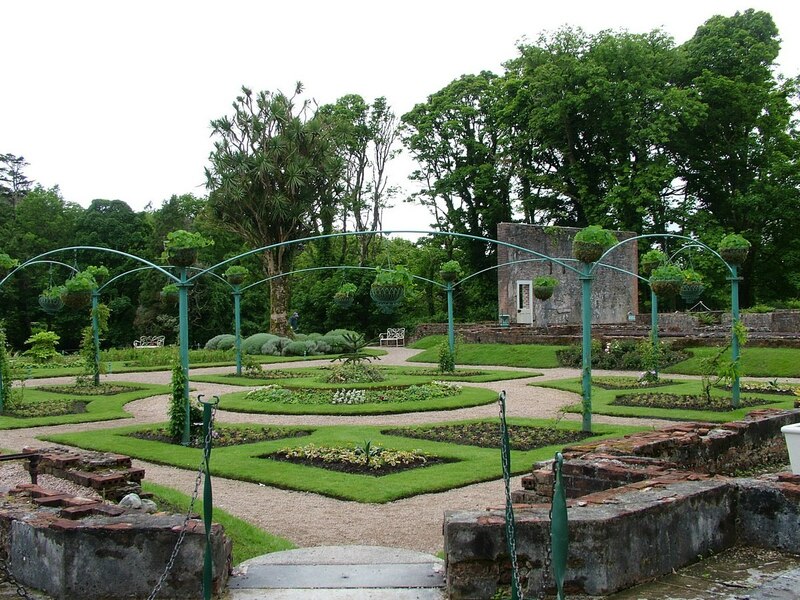 Henry’s was the largest and one of the last walled gardens to be built in Ireland during the Victorian period, and was celebrated as the only Walled Garden established in the middle of a bog (peatland). These six acres of the original 8.5 acres of cultivated land were completely enclosed by high walls constructed from brick and limestone. This work was done at the same time as the Castle was being built. 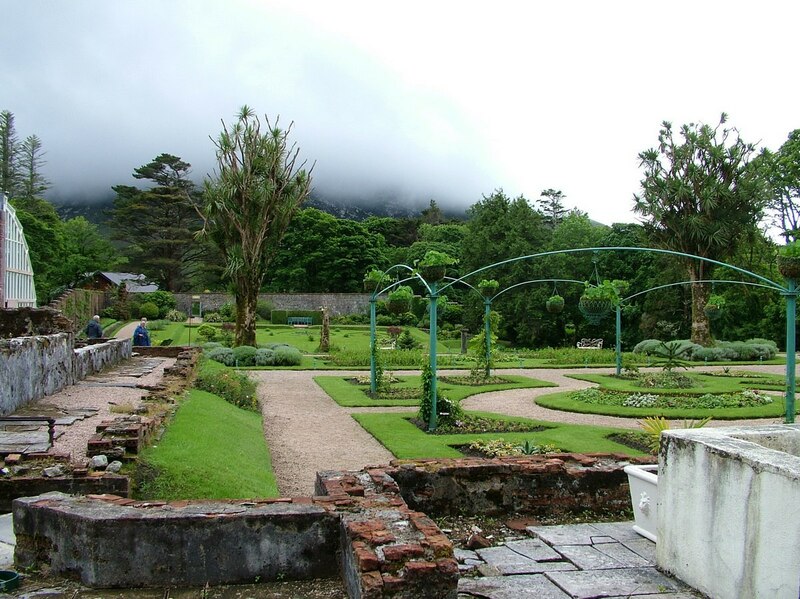 The walls were intended to keep out intruders but more specifically to protect the gardens from harsh weather. Connemara has a wet and windy climate marked by westerly gales off the Atlantic Ocean and cold easterly winds, so the lofty walls helped to create a micro-climate within the contained area. Bob and I were among only a few patrons the day we visited so we felt like it was our own Secret Garden. 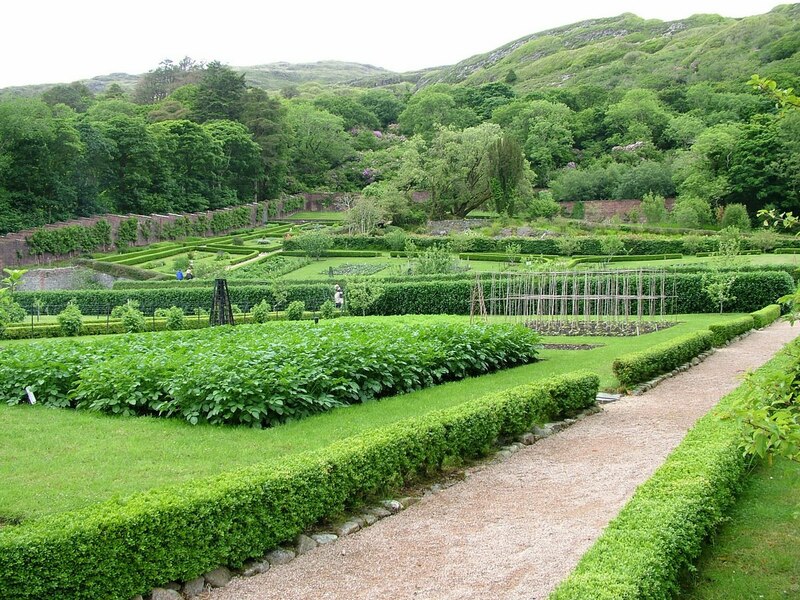 The Garden was large enough that the Henry’s designated two separate areas within the walls. They are separated by a natural mountain stream, a Fern Garden, and plantings of trees. The smaller section, the Flower Garden, is complete with perfectly manicured geometrically-shaped flowerbeds set into an immaculate lawn that slopes down to a central footpath. 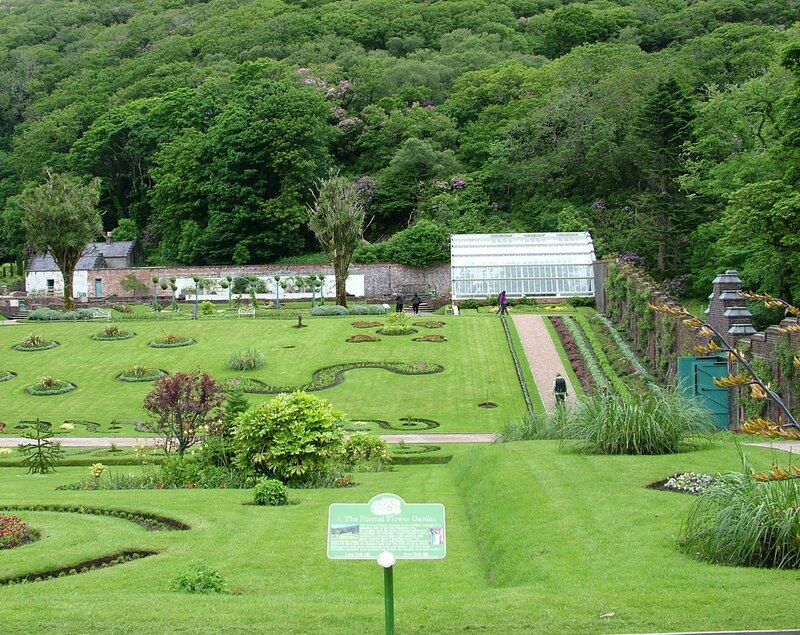 The Flower Garden or Pleasure Garden was large enough to supply fresh flowers for rooms in the Castle. 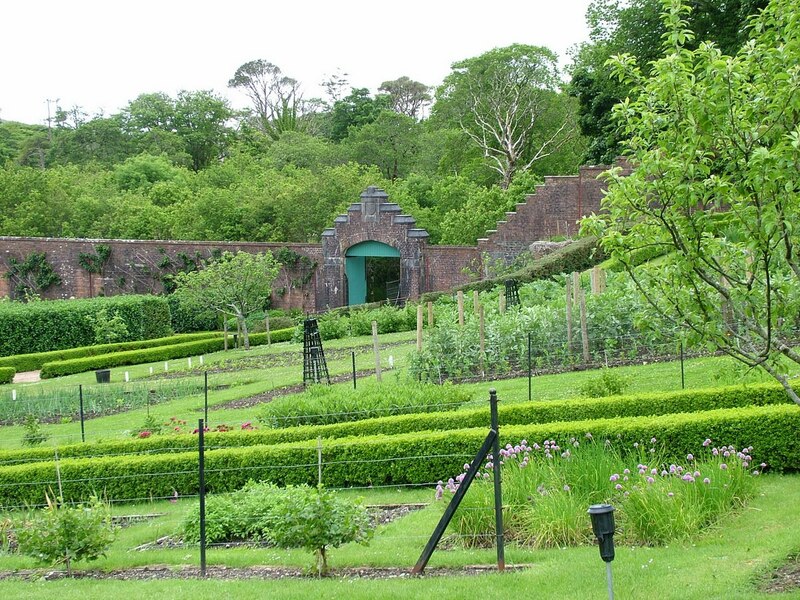 The larger portion of the Victorian Walled Garden was reserved for the Kitchen Garden where the Henry’s concentrated on growing fruits and vegetables for their own table. The Kitchen Garden was further divided into four areas with vegetables and herbs being grown on raised beds to facilitate good drainage. As Bob and I strolled around the Flower Garden, it was with great admiration that I surveyed the meticulous shaping of the flowerbeds, the exquisite symmetry, and the extreme attention to detail. 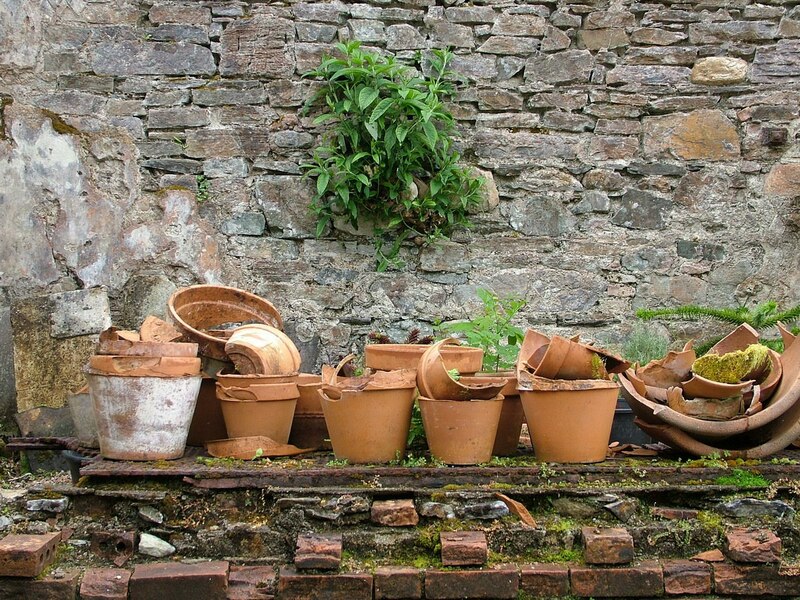 It is no wonder that Mitchell Henry employed an army of gardeners since so much work was required to maintain the high standard. At that time of deep economic depression, Henry paid his hired laborers well. In two months, they earned enough to cover their annual rent. That was an unprecedented amount for peasants in feudal Ireland. 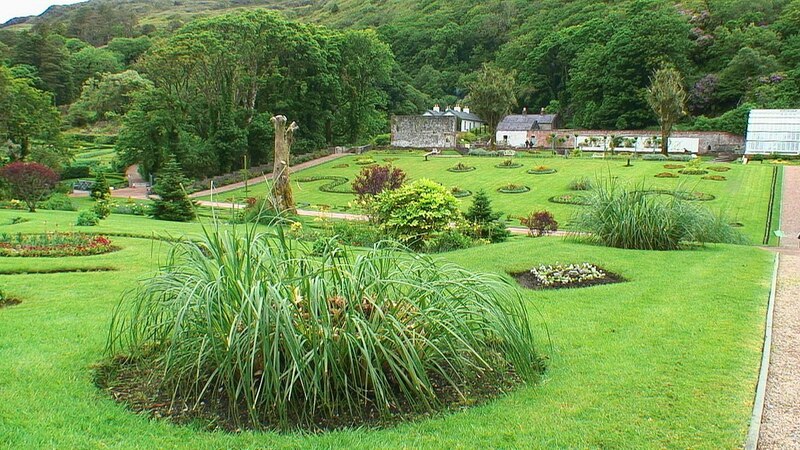 What an intriguing garden with the quaint Head Gardener’s Cottage and whimsical Workman’s Bothy set off to one side of the formal plantings. They have been totally restored to their original condition. When we paused to listen to the quiet sounds of nature, it was easy to imagine the echos of childhood laughter that once filled this delightful oasis of fun when the Henry’s’ children would frolic and play there on those rare sunny days. The pathways and hedges, bridges and hidden nooks, all made for a wonderful playground filled with mystique and adventure. The next stage of our visit saw us entering the once-spectacular Glasshouse area of the Pleasure Garden where exotic plants and fruits grew in a dramatic range of glasshouses. 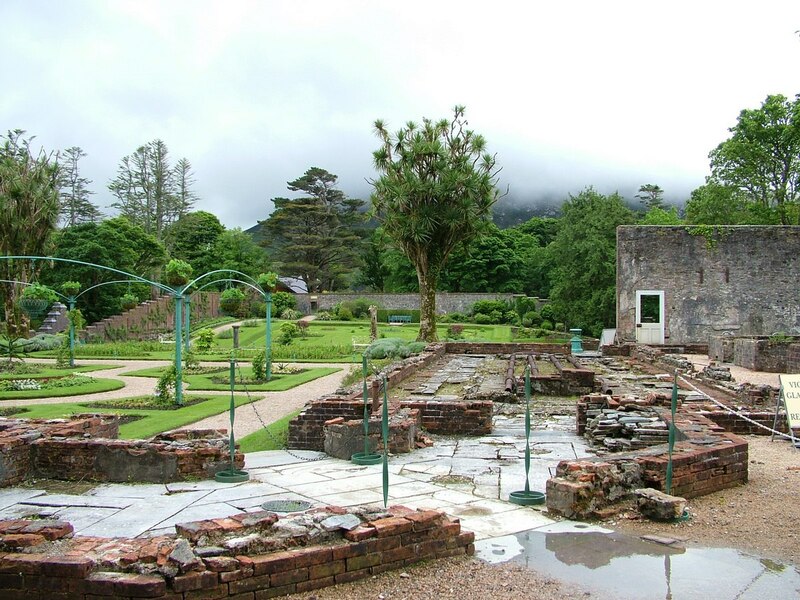 On our right, one of the original brick walls left behind from a derelict glasshouse remains where it waits to be incorporated into the next glasshouse to be restored. 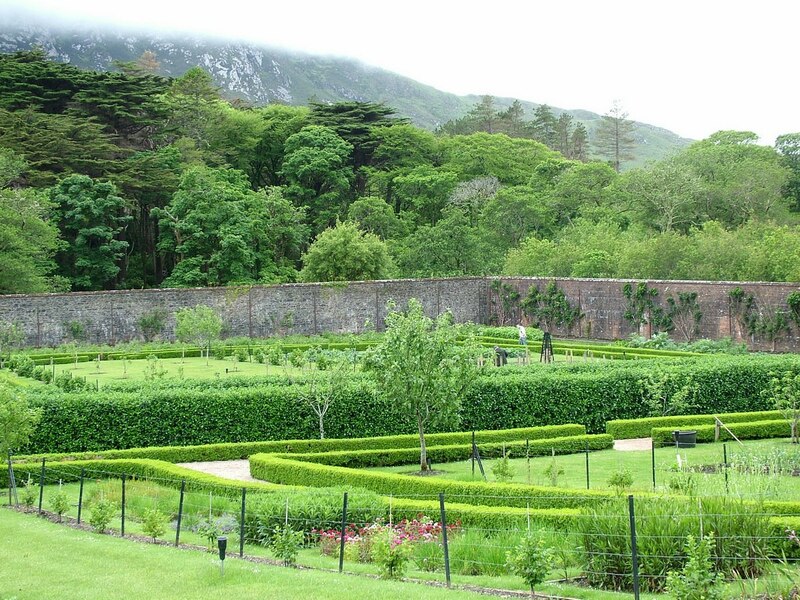 The Henry’s and their nine children enjoyed a lavish lifestyle at Kylemore until tragedy struck in 1874. 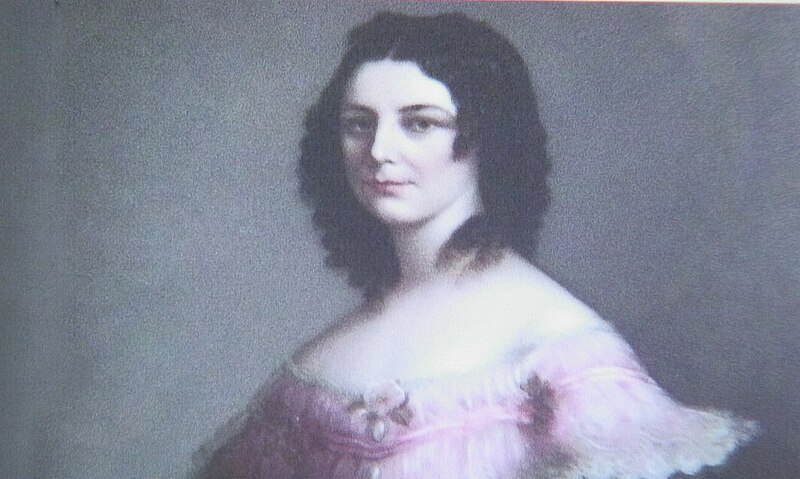 Margaret died of a fever contracted while on holiday in Egypt. Mitchell was heartbroken but retained ownership of the Castle until shortly after a subsequent calamity, the death of one of his daughters in a riding accident. In 1903, the Castle was sold, and in the ensuing decades, the Gardens fell into decline because of careless management and lack of a head gardener. Evidence of that deterioration is still evident today. Thanks to a community of Benedictine nuns who purchased Kylemore Castle in 1920 after fleeing war-torn Belgium, restoration work was begun. They were busy running their well-known boarding school in the newly-minted Kylemore Abbey, so progress was slow and arduous. With the help of a new head gardener, the nuns worked tirelessly to preserve the Victorian Walled Garden until finally finances ran out. Over time, the Flower Garden became a wilderness, and the glasshouses collapsed leaving only their brick bases. Then, in the mid-1990’s, restoration work began in earnest. 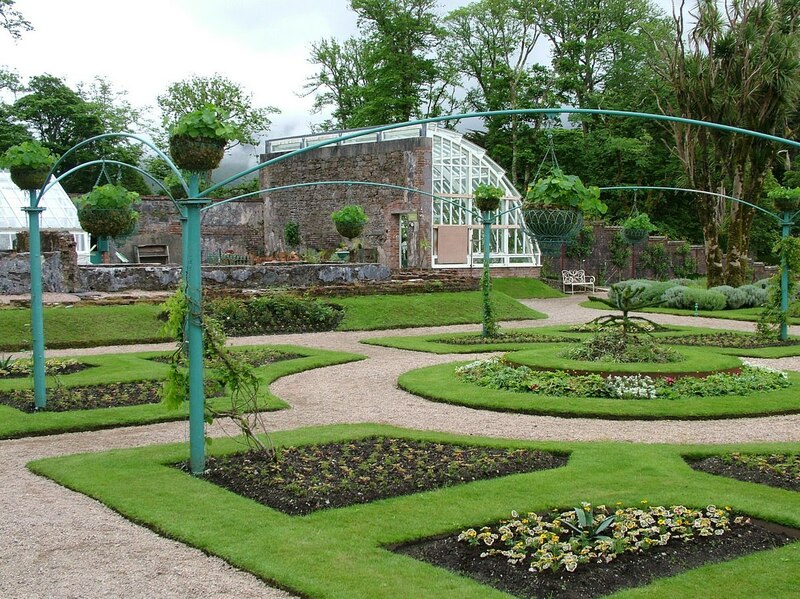 Through the auspices of Great Gardens of Ireland Restoration Programme, grants, substantial bank loans and the generosity of donors, the Benedictine nuns were able to oversee the Walled Garden repaired and refurbished to some of its majestic splendour of the 1870’s. It, once again, became an award-winning piece of Ireland’s cultural and natural history and won the prestigious Europa Nostra Award in 2002. To date, only 2 of the original 21 glass greenhouses have been restored, but in their heyday, the greenhouses were so large that they stretched from one end of the garden to the other. Margaret Mitchell’s fairytale existence included winter walks in protected tropical climes while outdoors, wild cloud-stained skies and too oft wet conditions ruled. Bob and I marveled at the ingenious creativity that Mitchell showed when directing the construction of 5,000 feet (1,538 m) of underground hot water pipes in order to heat the glasshouses. Huge engineering feats were successfully employed when he put in place three boilers to heat the water, one of which doubled as a limekiln. The artificial environment sustained in the greenhouses allowed the Henry’s such exotic tropical treats as lemons and bananas, figs and grapes, and pineapples and oranges from individual glasshouses designated as vineries, pineries and orangeries. 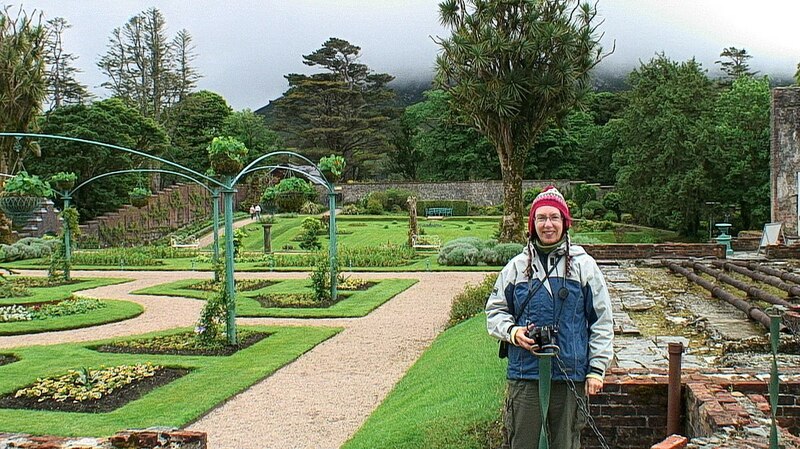 It was a cool, damp day when Bob and I visited the Victorian Walled Garden, but it was easy to see how the south-facing gardens were able to support the growth of nectarines, peaches and foreign plants. The thousands upon thousands of trees that Mitchell Henry arranged to have planted on his estate served as an excellent windbreak for the Medieval-styled fruit orchard and exotic gardens, and they still play an important part in the success of the Garden today. 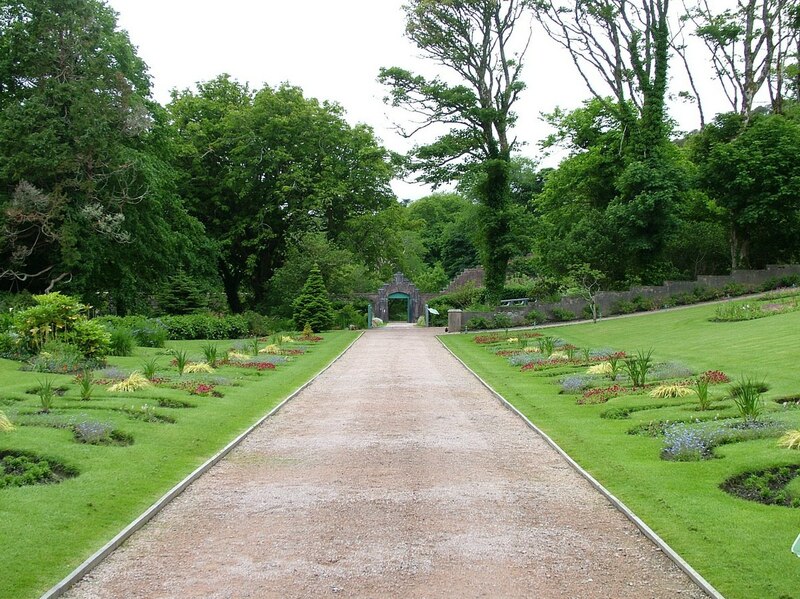 Bob and I thought it admirable that the Victorian heritage of the Walled Garden is honoured so carefully. Only flower and vegetable varieties that were available during that era are grown in the gardens today, and all of them are started from seeds right there on the grounds. 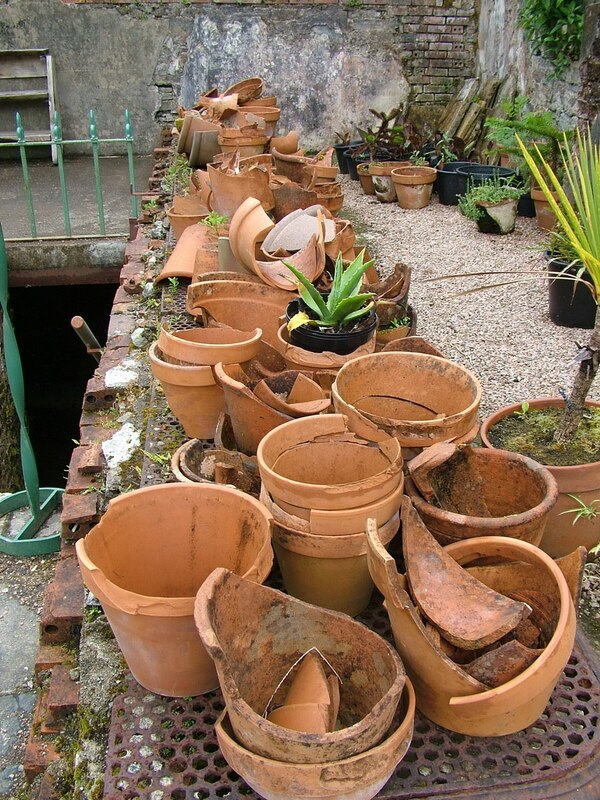 As avid gardeners ourselves, it was reassuring to see the evidence of past growing seasons carefully stowed for further use. It also lent a rustic and more casual air to the otherwise pristine layout of the plantings. 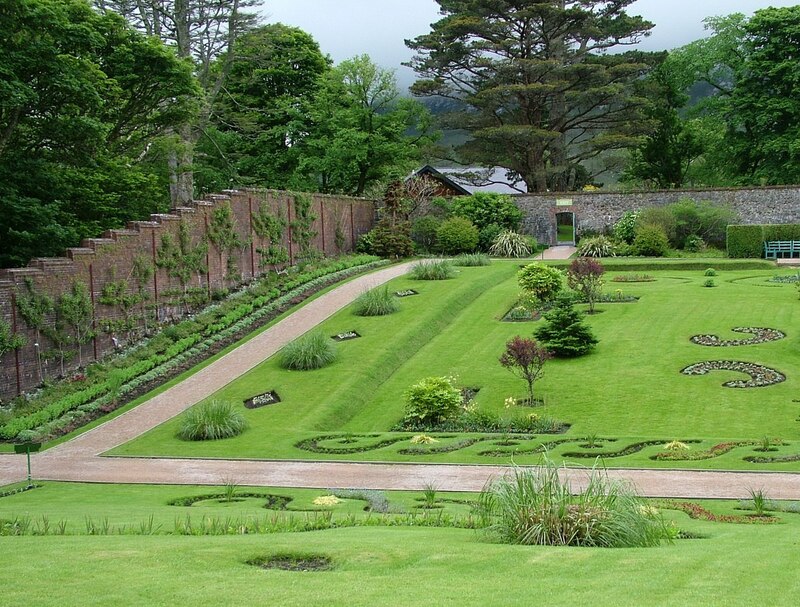 At the height of its success, taking into consideration all of its advancements, the Victorian Walled Garden was compared in magnificence to Kew Gardens in London , England. The footpaths next conducted Bob and me towards the Kitchen Garden seen here through the trees. 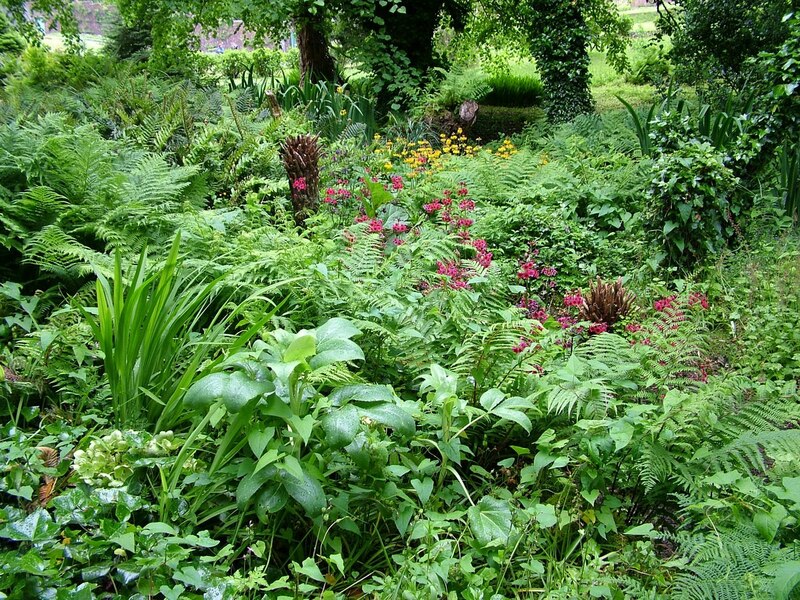 The Fern Garden was flourishing there in the shade while nearby the stream gurgled gaily, completing the woodland setting that divides the Kitchen Garden from the Flower Garden. Bountiful masses of shade-loving plants added to the hedgerow making the bower an interesting location to seek respite from the sun on those rare sunny days. By this time, we were actually enjoying some sunshine ourselves which helped to discourage the pesky midges that had pestered us earlier on. 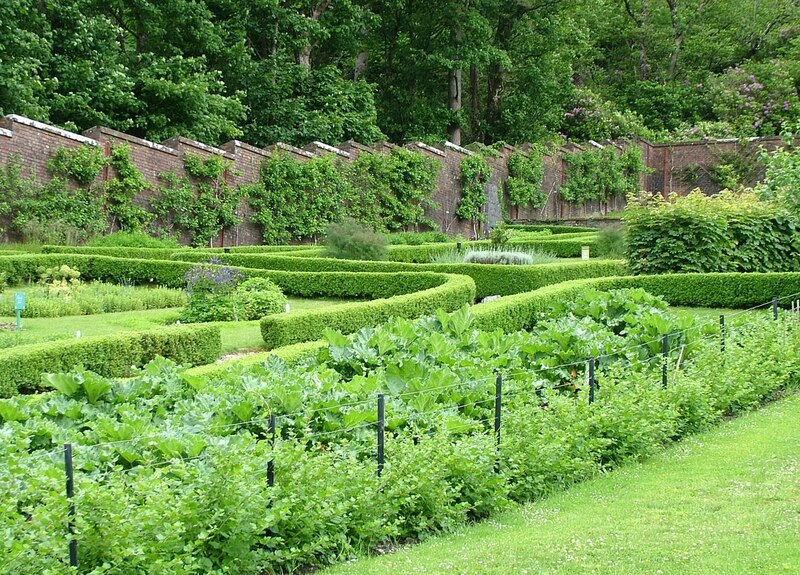 As Bob and I strolled the intersecting trails of the Kitchen Garden, we were struck by the dense forest of trees clambering up the side of Diamond Hill just the other side of the high brick wall that encloses the Garden. As already mentioned, Mitchell Henry cleared and drained the bogland on his estate then went about planting thousands of native oaks, some conifers and select specimen trees from around the world. A favoured tree was the Monkey Puzzle Tree, a species grown by many such affluent gardeners at the time. 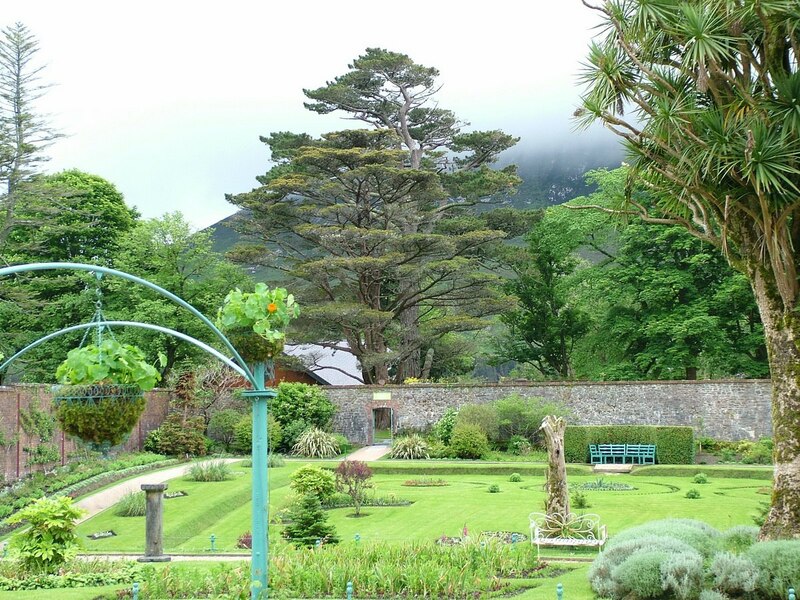 Kylemore gets its name from the Irish “Coill Mor“, which means Big Wood. Even before Mitchell Henry began his reforestation project, the area was referred to as Big Wood because of the hanging woods on the north side of the lake. When a woodland grows up the slopes of mountains and hills or clings to a steep cliff face, it is called a hanging wood. Virgin Irish Oak Trees had dominated the landscape for centuries, but by the end of the 1800s, much of the area was deforested as the wood was the preferred choice for shipbuilding and timber. 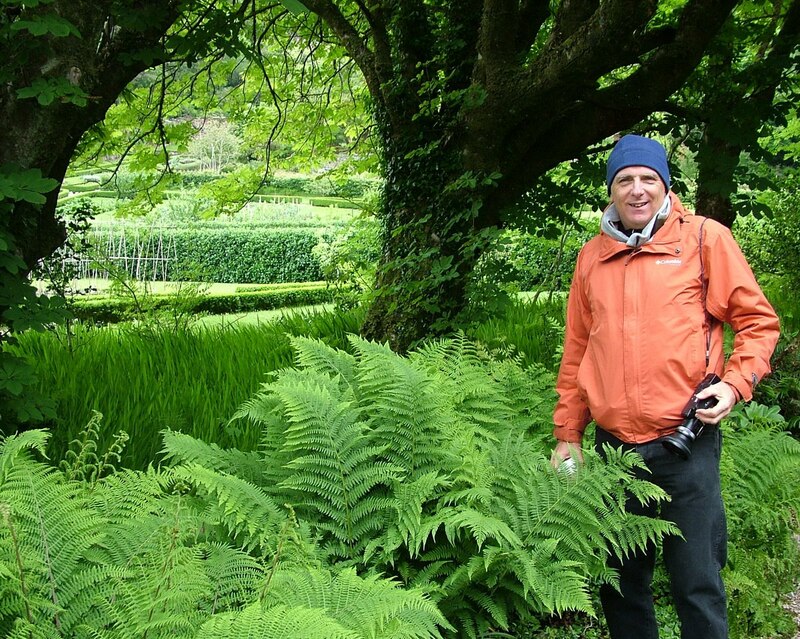 So, Mitchell Henry, besides just building an impressive windbreak for his cherished Garden, also went on to rejuvenate the depleted deciduous woodlands. It is said that over 300,000 trees were planted per year, and despite the harsh weather conditions, the majority of them grew successfully. 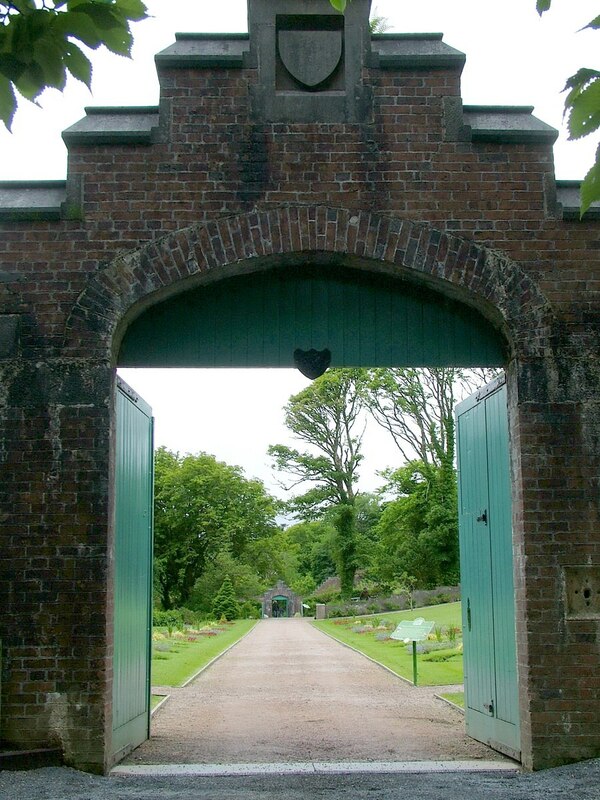 With the thick canopy of trees embracing the Victorian Walled Garden, it certainly made Bob and I feel protected and sheltered. We were so removed from the outside world. 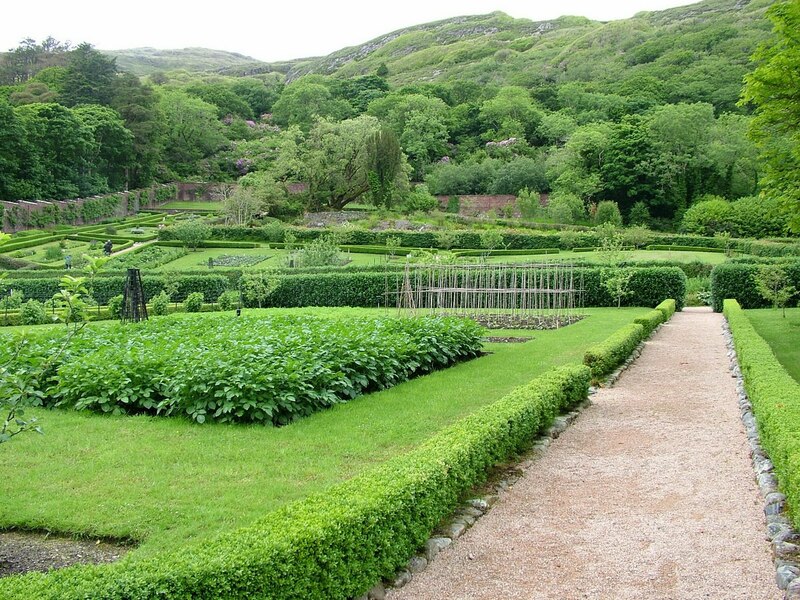 The artistry that went into designing the various vegetable plots came with the result that the Kitchen Garden was almost as attractive to tour as the Flower Garden. With raised beds and tidy contoured hedges, it was masterfully designed. Since the afternoon hour was getting late, Bob and I had to face reality. 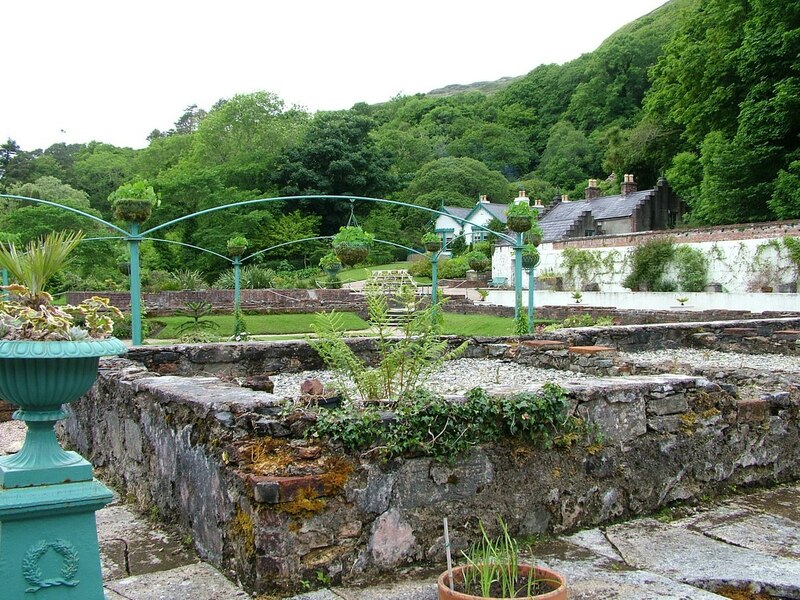 We could no longer dally in the footsteps of the Mitchell family as much as it was fun to imagine them taking even more pleasure from their productive garden than ourselves. They must have experienced such an overwhelming sense of accomplishment. Imagine strolling through a scent-filled tropical plant house and enjoying bananas in the wilds of Connemara in the late 1800s. Mitchell Henry left a lasting impression on the landscape of Connemara as well as on the memory of the local people. His tenants grew to love and appreciate their landlord who saw to it that windows were installed in every tenant’s cottage. There was lots to think about as Bob and I took our last long walk through the Victorian Walled Garden. 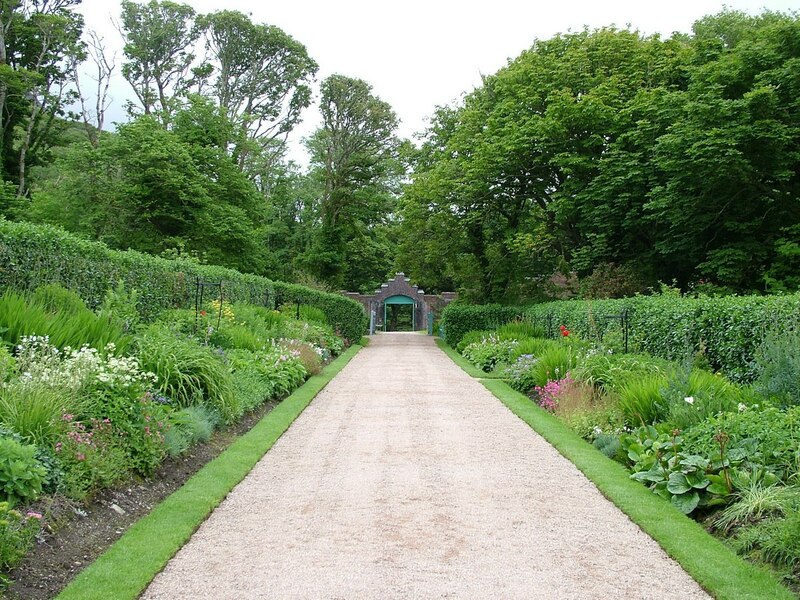 Shepherding us towards the arched gate that is the exit was a double herbaceous border that edges the footpath. Even in the Henry’s day, it was and still is the longest such border in all of Ireland.